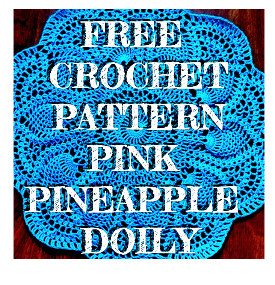 It's just too much fun to find all of these amazing free crochet patterns. 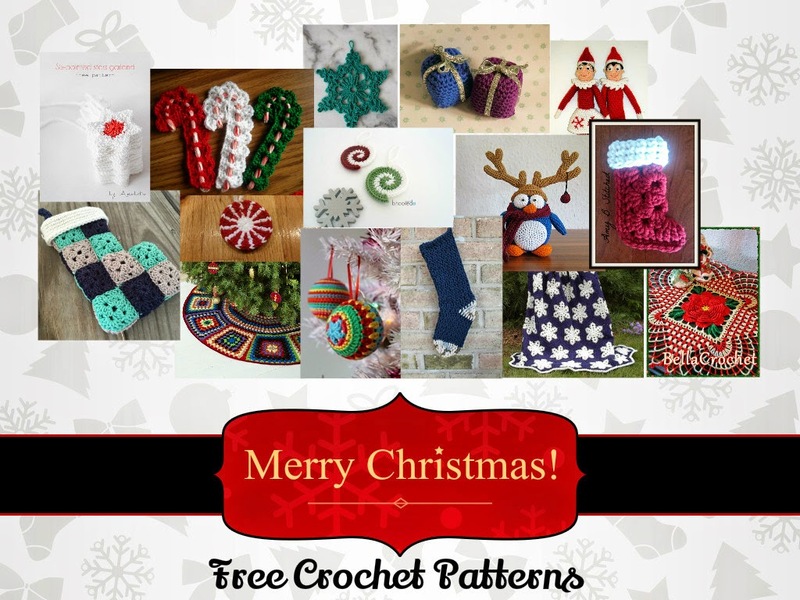 My last round up was a collection of free crochet tree patterns but this collection is going to be a little bit of everything to bring your home some holiday cheer this season. All of these patterns are free at the time of posting but some of them are specials for the 2014 holiday season and some of these patterns may not be available for free in the future so make sure you download them all now! Special Note -- I do not own any of the pictures on this post. Please do not use these images with out first contacting the original owner, Thanks and enjoy all of these wonderful patterns. The image credit links point to the designers Ravelry page or somewhere similar where you can see more of their amazing designs...so make sure you check those out too! This Christmas stocking is great for the whole family. You can choose any color to suit your mood and add some of the awesome snowflakes featured later in this collection of patterns as an embellishment. The blog is in German but the pattern is in English and very easy to follow. These crochet penguins would look adorable on your mantel with all of your holiday trinkets. Cover your home in peppermint candies this holiday season. I can picture these all over my Christmas tree this year. Use green yarn to make spearmint candies. Make sure you use stay on the small side with hook size (for yarn weight) so that the stitches are tight and close together. The pattern used a 4.0 mm hook and worsted weight yarn. I love doilies and this pattern is so intricate, it would make any table stand out as something special this holiday season. It looks really complicated but I would personally list the pattern somewhere around intermediate. Even a determined beginner may be able to figure this one out. 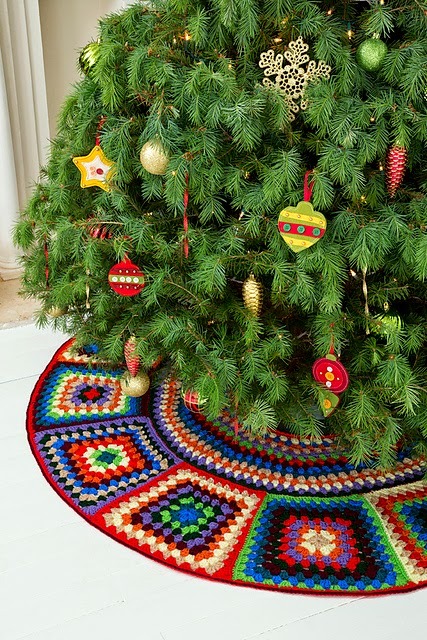 A tree skirt is on my crochet to do list and hopefully this summer coming up I will be making one, I sadly have run out of time this year and I will be using my old standby. 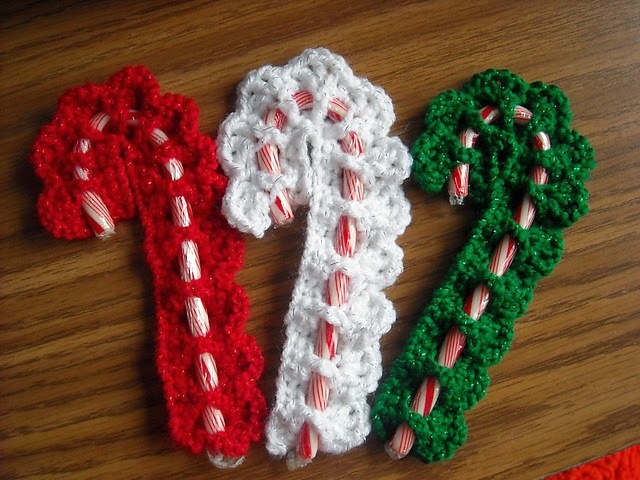 Something like this would be a great thing to crochet now to pass on to your youngsters when they put up their first Christmas tree. 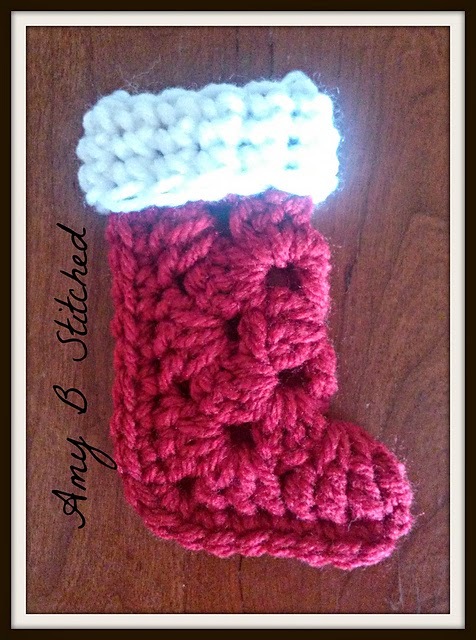 This little stocking features my favorite crochet pattern of all time. 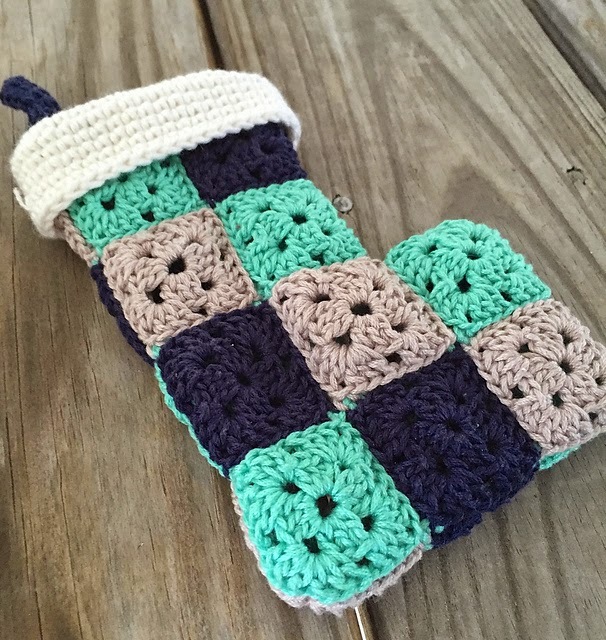 For those of you that don't follow this blog, that would be the granny square. 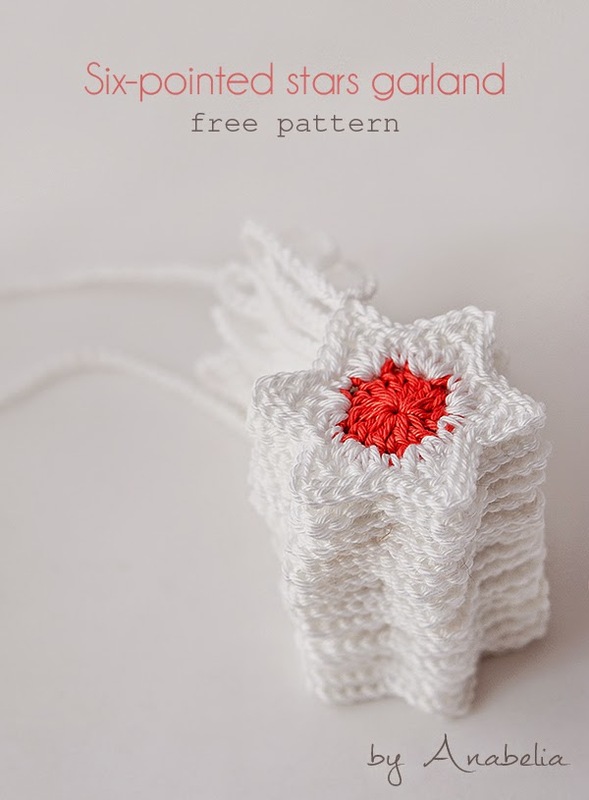 I love this pattern and how easy it would be to make a lot of these in a short period of time. They remind me off all the blankets my mom used to make and would add so much character to any Christmas tree. Give candy canes as gifts. One of these slipped under the ribbon of a Christmas gift would be an instant hit. It's the gift that keeps on giving because the next year someone else can stuff a candy cane treat into the little sling and give it away as part of their gift. Why buy one of those nifty elves when you can make your own with your own two hands. This pattern is free for a limited time and looks so close to the store bought ones....but this little guy will become a keepsake and family heirloom for you to pass on when the time comes. I feel like this snowman is just waiting for a little of that magic that brings frosty to life, then he would jump off your tree and run outside before he melts. He has so much character. This crochet snowman is also a larger ornament that will really stand out on your Christmas tree. This ornament will stay in your family for generations to come. I love these little wreathes. They are really simple to make and I think a lot of them could be made at one time. It's two spirals put together with a bow. Who would have thought something so simple could create a fancy looking wreath that is so nifty. 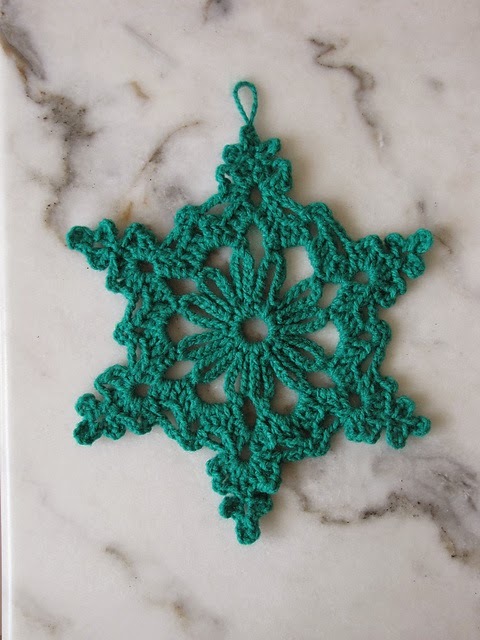 This link includes three free patterns for different snowflakes to crochet. I didn't know Better Homes and Gardens provided free crochet patterns but they have these beautiful snowflakes featured on their website. You can never go wrong with crocheted snowflakes. I love the color choices the designer choose. They aren't traditional Christmas colors and that add a lot of different colors to your holiday pallet. 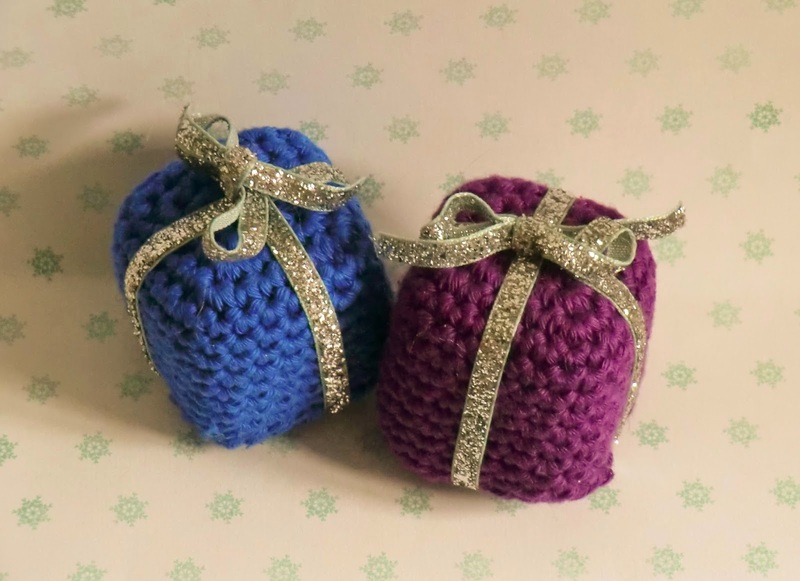 These little ornaments are perfect for small children and pets because they are made with polystyrene balls and won't break if they fall off the tree. This pattern is also written in UK terms but the US stitch equivalents are given in the pattern. Curling up and watching Christmas movies under a fancy afghan is one of the best things about the holiday season. This snowflake afghan is perfect for just that. It is completed by making the individual pieces with the snowflakes and then you attach those pieces together like a quilt. This is another Christmas tree skirt but it has been made in the primitive style that is really popular right now. Each little pieces is made individually and then the pieces are crocheted together in the motif pictured. 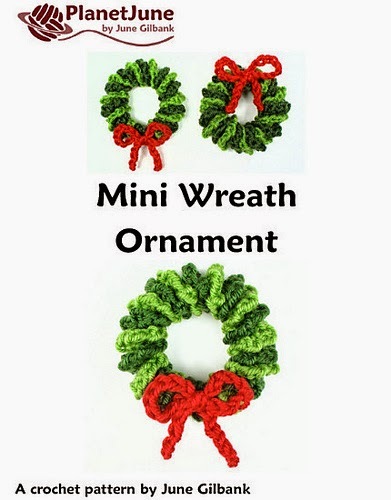 These little gifts could be used as an accent on so many different Christmas crafts. I could see them on my tree as an ornament all by themselves or possibly even as part of a wreath. Keep in mind this pattern has been written in UK terms and all of the single crochet (US term) are listed as double crochet (UK term). The gold ribbon adds really finishes off the pattern. And lastly I had to find another pattern featuring granny squares that would make your home feel more festive this holiday season. 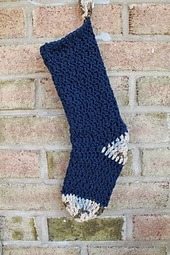 This stocking is really easy to make because you don't have to worry about a heal, which in my opinion is the trickiest part of stockings and socks. Are you looking to decorate your Christmas tree a little different this year? This garland is the personal touch you have been looking for this holiday season. The pattern is given in the form of a diagram and it only takes two rows to finish this perfect little star. More Christmas ornaments. 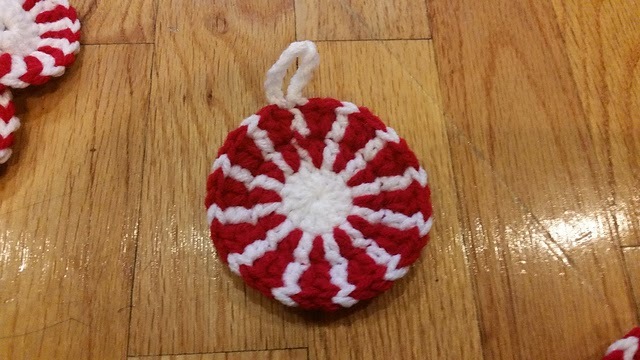 There are so many different patterns out there for crochet Christmas ornaments I am sure you could decorate an entire tree with crochet. Her is another one for the list. 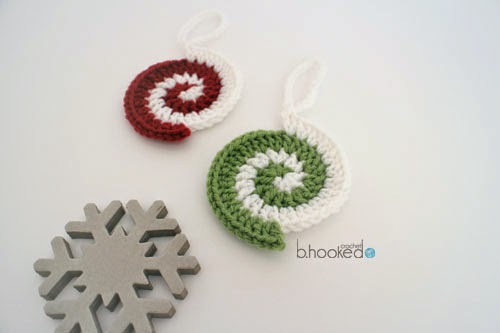 Crochet spirals are so nifty and they add would add a bit of whimsical fun to your tree. This another one of those patterns that would ship very easy which is great for gift giving, also child and pet friendly because you can not break them.